Everyone says backup your stuff, but many of us still neglect to keep backup of our import stuff. Once we loss that stuff that time we will realise our mistake. This is actually happened to me recently when my Internet connection suddenly stopped working on my home. At first I thought the problem is with my ISP (internet service provider) itself, but when I ask them they said we don’t have any problem with our end. So this confirmed me that there is some problem with my side itself. After investigating I noticed that my Router configuration has actually changed some settings and this causing me some connection problem. If I had a backup of my Router (TP-Link) settings then I could easily restore to working configuration. But unfortunately I didn’t have any backup of my router configuration so I had to fix that issue for almost 7 days by doing lot of research online. Anyway, this incident thought me a good lesson to keep backup of important stuff. If you keep backup of your BSNL Broadband configuration and if something went wrong with your configuration then you can easily restore to working settings without bothering much. Keeping configuration backup is really a easy process, follow the below steps. 1. Login to BSNL configuration page at http://192.168.1.1/. It will ask for username and password, when it asks enter admin for both. 3. Now you will be in Backup and Restore configuration page. To backup configuration, Just click Backup button under Backup Configuration. By default it will be saved as Conexant.icf file name and *.icf as file extension. 4. If you want to Restore BSNL Configuration file (*.icf), click Choose File button and then locate the BSNL backup file and click Restore button to restore from that file. 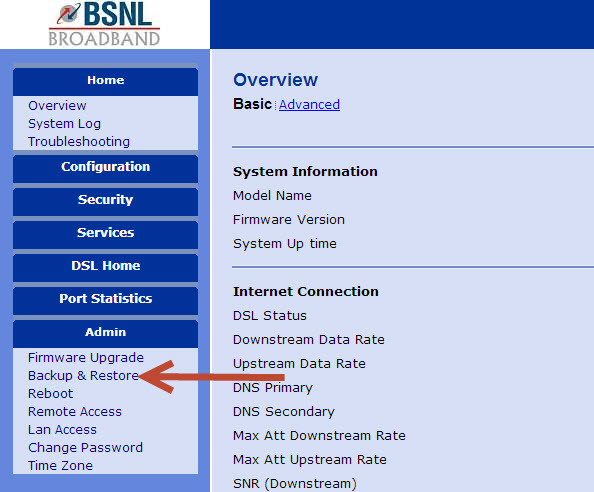 This is the process to backup and restore your BSNL broadband configuration file. Always keep working configuration backup or else you will suffer a lot if something went wrong. Hi, Arun I am shivaraj from Koppal,Karnataka, I am a regular visitor of your site.nice presentation of Topics. Off Topic: Hi Arun i am new to blogosphere, some body from Turky and korea are trying to hack my blog. as i am using W3 Total security. and i am getting regular e-mail of data modification. is it a serious case ?? Please help me give some insights of blogging .. Ya I still remember you..Regarding your blog hack attempt I can give few tips but I’m really not aware of your email alerts. 3. Google for how to secure wordpress blog.